A new EWG analysis estimates that at least 27 percent of more than 84,000 foods in EWG’s interactive Food Scores database, contain artificial trans fat, a manmade, artery-clogging, industrially-produced fat that bears part of the blame for the American heart disease epidemic. Another 10 percent of the foods in the database have been made with ingredients likely to contain trans fat. This means that fully 37 percent of the foods in EWG’s extensive database, which covers a wide variety of items commonly available in supermarkets across the nation, probably or certainly contain a substance strongly implicated in heart disease. Worse, in most cases, shoppers have no way to make an informed choice to avoid a product with trans fat. 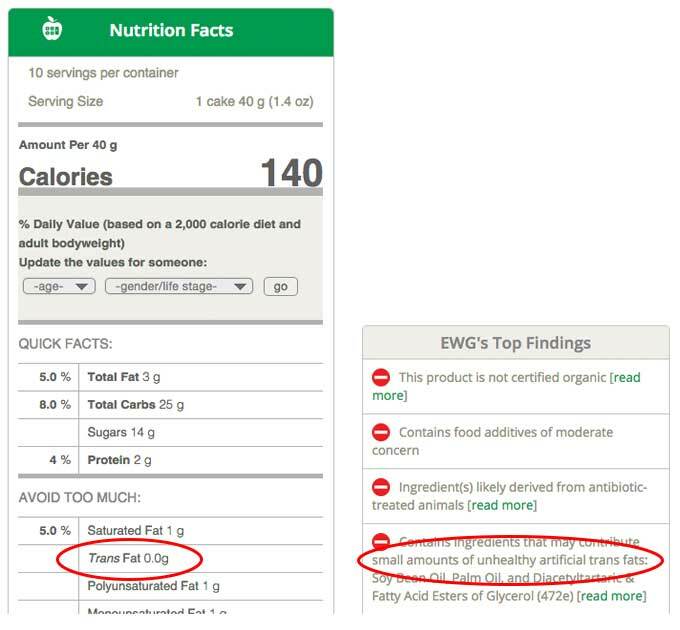 Only two percent of the foods in EWG’s database admit on their labels that they contain trans fat, according to our analysis of information in EWG’s Food Scores, a comprehensive tool with extensive information on ingredients and potential contaminants. The vast majority of foods with this substance escape notice by slipping through a federal regulatory loophole that permits trans fat content of less than half a gram per serving to be rounded off to zero. EWG found that 87 percent of more than 7,500 foods containing partially hydrogenated oils – Americans’ principle dietary source of trans fats -- didn’t disclose that fact. Instead, the labels of more than 6,500 of these items rounded off their trans fat content to 0 grams. Because of the trans fat loophole, thousands of nutrition labels on supermarket foods are misleading, and the consequences are serious. Those undisclosed half-gram squirts and dollops of invisible, hidden trans fat add up fast —and even faster for children, who need fewer calories than adults and should consume relatively less trans fat. A few slices of frozen pizza and a packaged cookie or two can spike a child’s trans fat intake to unhealthy levels. Serving size is critical – and it’s easy to underestimate. A person who eats an entire package with several small “servings” can consume multiple grams of trans fat at one time. Here’s EWG’s list of the worst of the worst – products with trans fat content of five grams or more – roughly double, or worse, of the World Health Organization’s recommended limit of less than two grams of trans fat daily for a person who consumes about 2,000 calories a day. Because FDA rules allow food companies to avoid disclosure of trans fat if the levels in a serving are low enough, the true number of processed foods containing trans fats could be even higher than our estimate of 37 percent of supermarket foods. And it likely is. This much is certain: trans fat is ubiquitous in the food supply, thanks to decades of lax regulations, and it’s dangerous. The food industry claims that it produced only two billion pounds of partially hydrogenated oils in 2012—but that’s enough for 434 grams of trans fat per American – a wildly excessive amount (FDA 2013b). A single serving of more than 400 products in EWG’s Food Scores contain enough trans fat to exceed the World Health Organization’s recommended limit of less than 2 grams per day for an adult consuming a 2,000 calorie diet. The Institute of Medicine, an arm of the prestigious National Academies research complex, has gone even further, declaring that trans fats have “no known health benefit… [and] no safe level.” The Institute of Medicine’s conclusion, issued in 2002, is one factor driving a current effort by the federal Food and Drug Administration to crack down on trans fat in the American diet. Numerous other expert panels agree with the Institute of Medicine’s conclusions. The FDA is preparing to issue a regulation that, according to some reports, could eventually lead to a drastic reduction in artificial trans fat that, up to now, has been added to a wide variety of commercial goods, including frozen breakfast sandwiches, frozen cakes and pies, frozen pizza, frozen French fries, cookies, crackers, microwave popcorn, non-dairy coffee creamer and other processed foods. FDA officials say their plan, unveiled in November 2013, could eventually avert up to 20,000 heart attacks and 7,000 deaths a year – numbers of illnesses and deaths that the U.S. Centers for Disease Control and Prevention attributes to coronary disease caused by trans fat consumption. The changes FDA officials are contemplating could transform the American food supply for the better. But that transformation won’t happen overnight. Plenty of devils lurk in the details of the anticipated FDA action. Though some reports call it a ban, it is more properly described as a phase-out. The FDA’s November 2013 proposal said that once the agency made its decision final, it would “provide adequate time for producers to reformulate products in order to minimize market disruption.” If the food industry stays true to form, it is likely to battle for every inch of ground and wind up slow-walking the issue into the next decade. The final FDA regulation, which could become public in coming days, is unlikely to close the half-gram trans fat loophole in the food labeling law. In the meantime, consumers need help to make informed choices. That’s where EWG comes in. To find the truth about the trans fat content of processed food, EWG has looked beyond labeling claims and ad hype. We programmed our Food Scores database to tell us which supermarket foods contain partially hydrogenated oils. These are vegetable oils that have been hardened through an industrial process called hydrogenation. This process serves to stabilize them, preserve flavor and lengthen the shelf life of the products to which they have been added. Food processers like partially hydrogenated oils because they give the finished product a creamy texture, are cheap and, by prolonging shelf life, ease the logistics of distributing heavily processed items for a mass market (GMA 2013). But public health agencies overwhelmingly have concluded that these oils are the primary source of artificial trans fat in the American diet and a major contributor to the risk of heart disease, the leading cause of death in the U.S. The CDC says that trans fat increases low-density lipoprotein (LDL, or "bad") cholesterol and may decrease high-density lipoprotein (HDL, or "good") cholesterol, making trans fats even worse for heart health than the saturated fats they were designed to replace. The FDA wants to strip partially hydrogenated oils of their favored status as “generally recognized as safe,” or GRAS, food ingredients, a designation that has enabled food processors to add them to food without notifying the agency. If the FDA gets its way, partially hydrogenated oils would be designated food additives. Food processors could not use them unless the FDA authorized the practice via a specific food additive petition. Since the Institute of Medicine, World Health Organization, CDC and other prestigious health bodies say these oils are not only useless but also dangerous, many observers predict that food companies would have a hard time justifying their continued use. If the FDA hangs tough in coming years, it can end most uses of partially hydrogenated oils in foods. Ban partially hydrogenated oils from food in the short run. The FDA said that if it takes away the GRAS designation of partially hydrogenated oils, the agency “intends to provide for a compliance date that would be adequate for producers to reformulate any products as necessary and that would minimize market disruption.” The FDA pointedly avoided saying how much time it would give producers to finish the job of driving these oils and the trans fats they harbor out of food. Completely remove artificial trans fat from the food supply. An FDA memo documenting a 2013 meeting between agency officials and Grocery Manufacturers Association representatives said that the industry claimed that partially hydrogenated oils had 200 uses in a large number of ingredients (FDA 2013b). Other memos documenting similar meetings said that the industry hoped to find a way to continue using partially hydrogenated oils, likely at levels that would not require disclosure. Close the half-gram artificial trans fat loophole. Modern scientific instruments have improved to the point that they can detect trans fat at less than a tenth of a gram. The FDA has not made clear whether it will attempt to narrow the exemption from a half to a tenth of a gram, or somewhere in between. Meanwhile, consumers can consult EWG’s Food Scores for information on which specific foods contain these trans fat ingredients. Nearly half of American men and a third of women will develop heart disease during their lifetimes, according to the federal Centers for Disease Control and Prevention (CDC 2013b). Scores of studies strongly implicate artificial trans fats with an increased risk of heart disease (Mozaffarian 2006; Teegala 2009; Micha & Mozzaffarian 2008). The risk of heart disease appears to increase with the amount of trans fat consumed by an individual (Brouwer 2013; Oomen 2001; Oh 2005). Scientists have not determined the mechanism that causes trans fats to contribute to heart disease. The consensus is that they raise the levels of bad (LDL) cholesterol in the blood, reduce levels of good (HDL) cholesterol and increase blood triglycerides —unhealthy fats that thicken the blood, increase the chances of clotting and risk of heart attack and stroke (EFSA 2010; WHO 2003). Trans fats may increase oxidative stress and inflammation in the body. They have been linked to insulin resistance as well (Bendsen 2011; Tarrago-Trani 2006) leading the World Health Organization to assert that trans fat may contribute to development of type-2 diabetes (WHO 2003). The case against natural trans fat that occurs in dairy and meat is murkier. Some scientists suspect that biological differences exist between natural and industrial trans fats rendering them less damaging (Aldai 2013; Oomen 2001); others have found there to be no difference between natural and artificial trans fats (Laake 2011; Motard-Bélanger 2008).